The forecasted lifespan of the valve-regulated lead-acid (VRLA) battery in an APC by Schneider Electric UPS is 3 to 5 years under recommended conditions; however, this life expectancy will fluctuate greatly depending on the following factors. Being proactive and aware of these characteristics and conditions will ensure you maximize the life expectancy of your battery and are prepared for any imminent power failures. When installing a UPS, the user should determine where to install the unit to best provide power protection of the IT equipment in the room. It is recommended that the UPS be installed in a temperature controlled environment similar to the intended application. The UPS should not be placed near open windows or areas that contain high amounts of moisture; and the environment should be free of excessive dust and corrosive fumes. Do not operate the UPS where the temperature and humidity are outside the specified limits. The ventilation openings at the front, side or rear of the unit must not be blocked. Further discussion on cooling strategies can be found in White Paper 68, “Cooling Strategies for IT Wiring Closets and Small Rooms”. Most single-phase UPS batteries are classified as “maintenance free” which leads many users to feel that monitoring and maintaining UPS batteries is unnecessary, however this is not the case. A maintenance-free battery only refers to the fact that these batteries do not require any replacement fluid, therefore understanding how to properly care for and monitor batteries is essential. At installation a battery is at 100 percent of its rated capacity, however each discharge and subsequent recharge will slightly decrease the relative capacity of a battery. 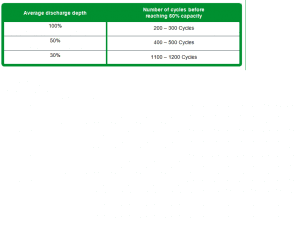 The length of the discharge cycle will determine by how much a battery’s capacity is reduced. While cycling is a necessary part of UPS operation, being aware of the cycling frequency will help to predict the life of a UPS. A battery is determined to require a replacement when it has reached the end of its useful life, which is defined as when it can no longer supply 80% of its rated capacity. When the battery reaches this aforementioned point, the degradation process speeds up, and a replacement battery is needed. It is important to note that while the useful life of a battery is defined as losing 20% or more of its rated capacity, the effects on actual UPS runtime can be much greater. what will happen if my UPS is in an area or room that sometimes gets to 80 degrees or more with humidity. thanks. Higher than recommended temperatures can be harmful to both your UPS and its battery. The American Society of Heating, Refrigeration, and Air Conditioning Engineers (ASHRAE) recommends operating temperatures for IT equipment like your UPS to be between 20-25°C (68-77°F). The allowable temperature range is 15-32°C (59-90°F). Your UPS will continue to operate in the allowable temperature range, and possibly even beyond, however the further away you get from the recommended ambient temperature of 25°C (77°F), the more the lifespan of your electronics will be decreased. Specifically concerning the battery, a general rule to remember is that for approximately every 10°C (18°F) above the ambient temperature of 25°C (77°F), the life of the battery will be reduced by 50 percent. If you refer to white paper 210 (http://www.apcmedia.com/salestools/VAVR-9MNSWC/VAVR-9MNSWC_R0_EN.pdf?sdirect=true) you can see a graph of the life expectancy of the VRLA battery decreasing as the operating temperature increases. As far as the UPS itself, this rule does not necessarily coincide exactly, but the principle is the same. The more you exceed the ambient recommended temperature, the more the availability and longevity of your equipment will decrease. 80°F is not far from the ambient recommended temperature of 77°F, therefore I would not expect any lifespan decreases to be substantial, especially if the environment only increases to this temperature occasionally. For further discussion on cooling strategies, please refer to white paper 68 (http://www.apcdistributors.com/white-papers/Cooling/WP-68%20Cooling%20Strategies%20for%20IT%20Wireing%20Closets%20and%20Small%20Rooms.pdf). Is it recommanded to cycle a UPS battery that is in use. I mean, is it recommended to disconnect the UPS from the main power and then have it discharge completely once every 3 months or so? Or if the UPS is plugged in and in use, nothing is required? No, we do not recommend any sort of proactive cycling. If you feel the runtime being reported by your UPS may be off, you can run a calibration via an NMC or PCBE, however you should try to avoid doing so more than one every 6 months to a year. Every deep discharge will shorten the lifespan of your battery, so you would want to avoid that whenever possible. What is the low DC voltage cutoff used to protect the batteries? Nice blog it is very helpful for us. thanks for this valuable knowledge. I want to know what is the general batteries life for UPS, like when do i replace the batteries. UPS and Batteries are used for critical area. The typical lifespan of the batteries used inside most APC UPSs is 3-5 years under recommended conditions; however based on the factors noted above, this lifespan could be reduced. If you are able to provide proper storage to replacement battery, you should be able to order the appropriate model through our UPS Upgrade Selector (http://www.apc.com/tools/upgrade_selector/index.cfm?ISOCountryCode=us&gclid=Cj0KEQjwipi4BRD7t6zGl6m75IgBEiQAn7CfF6TMO0uUPPM9k6HyCsgiM4-FDKxJYPJ9kTvX9bXip2gaAq9n8P8HAQ). Here are some tips on providing proper storage to an unused replacement battery for your APC UPS. “Lead-acid batteries like the ones used in single-phase UPS units experience automatic self-discharge, therefore it is recommended that a battery in storage be charged every 6 months. Regardless of the frequency of battery recharge, cumulative storage time should not exceed one year. Failure to follow these recommendations will result in permanent loss of capacity within 18 to 30 months. The biggest issue affecting batteries is heat, and running a unit in a sustained warm environment can cause a shortened life span and premature battery failure. A general rule of thumb is that for every 15°F increase in temperature over 77°F, lifespan will be decreased by 50%. On the colder side of things, you will see reduced runtime, but it generally will not have an adverse effect of the actual life cycle of the batteries. You may find that the runtime estimate provided by the UPS is not as accurate as the temperature drops. Below 32°F runtime will decline very rapidly and may quickly approach zero. For optimum performance we recommend an ambient temperature of 68-77°F. The dealer told me that he has to use more distilled water after about 8 months. Is that correct ? They mentioned this procedure is required every 3 months. Where do I get a comprehensive maintenance guide to verify these claims ? All of our single phase (and most, if not all, of our 3phase) units use maintenance free sealed lead acid batteries. There is no need to add distilled water or to check electrolyte levels. My questions are similar to Mike’s. If we are willing to sacrifice some battery run time in a UPS application to extend battery life, will maintaining the battery at a lower temperature extend the battery life? If every 15F increase in temp reduces lifespan by 50% then what is the corresponding increase in lifespan for every 15F (or every 1F) below 77F? Also, will the battery float charge voltage need to be reduced if the battery is maintained at a lower temperature. If so, by how much per degree F? The optimum temperature for a lead acid battery is 77°F . It is important to remember that the temperature inside your UPS will be several degrees warmer than the ambient temperature in the install location. We generally find the optimum ambient temperature to be 68°F. As you mentioned, every 77°F increase in temp reduces lifespan by 50%, unfortunately lowering temperatures does not have the same impact on battery life. As you get colder however, you will start to see a decline in runtime from the battery, which becomes a significant issue below 50°F. Below 50°F you should also rightfully start to scale back on charging rates. Back-UPS and Smart-UPS models do not have user adjustable charge rates. These models are best left to data center and (home) office type environments. Chances are, if you are comfortable with the temperature, your UPS will be too. I never knew this thanks for sharing! My question is how the cycles happen? If out of power, then back in 1 minute, will that be a cycle? Also if out of power, is it better to shut computer down immediately or wait the UPS to automatically turn off? 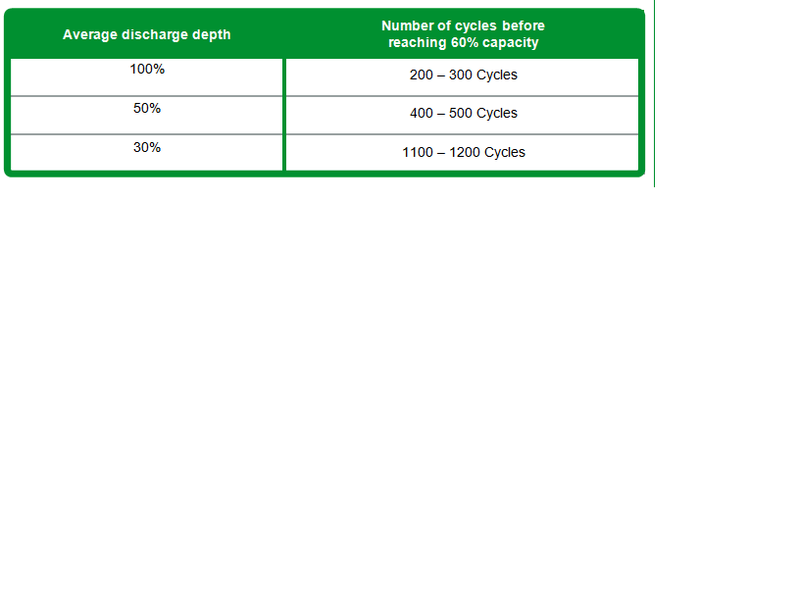 The length of the discharge cycle will determine by how much a battery’s capacity is reduced. Therefore, as an example, if the power is out for 5 minutes, but the UPS had 20 minutes of available runtime at full capacity, this will equate to approximately 0.25 discharges. If the battery is completely depleted, that will equate to an entire (100%) discharge. From the chart above, you can see if if the average discharge depth is 100% (the battery is completely depleted), you can expect the battery to last for 200 – 300 cycles. However, if the average discharge is only 30% (70% of the battery power remains when the power comes back) you can expect it to last for approximately 1100 to 1200 cycles. In regards to your second question, that is really up to you, the user. The less the battery is depleted during a cycle, the longer it will last. However, even at complete discharges you can expect the battery to last for up to 300 cycles. So it really depends on you using your best judgement to weigh continuing working and slightly shortening the batteries life vs. safely shutting down as soon as possible and maximizing the remaining life of the battery. I got a replacement last week for bx1100 that only lasted short of 2 years. under warrenty thankfully. the new unit I got is BX1400UI a higher capacity which can be connected via USB, pretty neat. normal use my setup consumes 170w and under load it goes a little over 300w. the APC service guy told me I should run a full discharge once every 1 or 2 month if I didn’t get any power cut, is that correct ? I hope this one lasts me for 3 years. it will probably get discharged 3 to 5 times a year. unless something happened. would it last me for 3 years? Apologies for the miscommunication with the APC service representative you spoke to, but we do not recommend a periodic full discharge and recharge of VRLA batteries like the one in the BX1200UI you referenced. Unfortunately, we cannot say with certainty that the battery in your APC UPS will last 3+ years, because there are a lot of variables that must be taken into account. 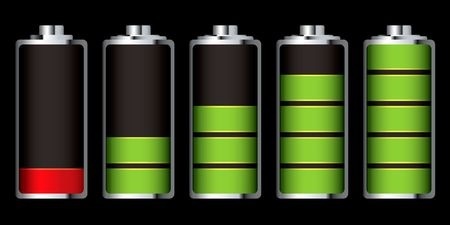 As the blog above references, the lifespan of your battery is dependent upon: unit placement, maintenance, ambient temperature, the number of discharge cycles, and the battery’s chemistry. Variances in any of these factors will affect the life of the battery; however, if you take the above recommendations you should be able to make sure you get the most out of the battery, and maximize its lifespan. I have a computer, router, external hard drive, and phone plugged into my UPS. When I have an outage I power down the computer. If I won’t be needing the other devices during the outage and want to preserve battery life, doesn’t it make sense to shut the UPS down? If your major concern is protecting the life of your battery, then yes, I would recommend shutting off the UPS after you have safely shut down your computer – and if you do not require the use of the other connected electronics. This is because even if the plugged-in equipment is not powered-on, the battery will slowly deplete until utility power is returned; and as noted above, the battery can only be charged and discharged so many times before reaching its end-of-life. However, note that if you do turn-off the UPS, the equipment plugged into the UPS will not automatically power back on once the power returns. You will need to physically turn the UPS back on once the power comes back. thanks for the article.if i am not using computer for a week should i cut off power coming to ups? If you are using our power management software, PowerChute, you can set it up so the UPS will allow your computer to safely shut down during an outage. If the computer is already powered down, or if it would not be an issue if it shut down improperly, you should be able to unplug the computer from the UPS while you are away. Hello, I have UPS and i use for charging laptop, Phone etc. We have a UPS for router and telephone in seasonal cabin. We usually turn off the power when no one is there. If we turn off the UPS that should prevent complete discharge, correct? It gets well below zero degrees F in the winter. If someone forgets to turn off the UPS and the battery discharges, will it freeze? Can we remove the battery and still use the power supply? Inevitably, an unused battery will experience a life cycle decrease. Lead-acid batteries like the ones used in single-phase UPS units experience automatic self-discharge, therefore we recommend that the battery is charged every 6 months if it is not in use. Regardless of the frequency of battery recharge, cumulative storage time without operation should not exceed one year. If you are unable to charge the battery it will result in a permanent loss of capacity within 18 to 30 months, but it should not harm the UPS. In regards to temperature, we recommend that the UPS not be operated in an environment below 32 degrees Fahrenheit. If the UPS is not operating, we recommend that it be stored at a temperature no lower than 5 degrees Fahrenheit. Just one question. Is connecting a Laptop to a UPS a bad idea?? As in, will it have the same effect as connecting two UPS in series??? There are absolutely no issues with connecting a laptop to a UPS. The laptop has an internal battery, which the UPS will continue to provide power to and charge in the event of a power outage. The UPS will also provide valuable surge protection to you laptop, keeping it safe from damaging surges and spikes. You also might want to consider plugging in your home network (router and modem) so you can continue to use the internet while on your laptop. Fire safety is our utmost concern. We’re seven miles off the coast of New Hampshire with no active fire department. We’d like to take whatever steps are necessary to ensure our UPS units are well maintained and operating safely. Is there a recommended replacement interval for the UPS batteries and/or the UPS units themselves? The batteries within these units have mfg dates going as far back at December 2009. I can only assume the units the same age. During the winter (mid-Oct through mid-May) what is the recommended storage procedure and suggested temperature? There are only two options for us – in a facility that is not heated for the winter (so storage temperature can expect to fluctuate with NH winters) or in a facility that is kept at a comfortable living temperature (60-80 degrees). Hello. I have a CyberPower CP900EPFCLCD ups. It has a single 9Ah battery. I don’t know when the unit was manufactured, but it says it was shipped december 2016 on the box. But I bought it this month, so it was sitting 10 months without recharging(but strangely on the first start the indicator showed 100% battery). For now I just simulated a power shut down for 5 min to check if it’s working, but do i have to make at least 1 full discharge of the battery or it doesn’t matter? Unfortunately, we cannot comment on best practices of other manufacturer’s UPSs. If you have a question regarding your UPS, we recommend reaching out to the original manufacturer. Due to other commitments, my UPS APC unit backups 1250VA (circa 2008) had recent battery failure, so a second as-new sealed in original carton was brought out and had to be put into use. The second unit was bought in 2008.
second unused unit now evidently charged to residual or present capacity, the first unit has seen replacement specification battery; and its fully charged. Both of these unit are same age and bought within about a year from Sams club in Anchorage. Had plans to use second one concurrently for other computer gear, but didn’t get the chance; other obligations spent the time. My question is about the out-gassing on the new-old battery after reaching whatever full capacity; as there is an oder. So my intention is to now swap out the new-old stock unit and replace that with the old unit that now has fully charged retail new batteries inside. These are (two) 12v 9Ah PS batteries. An electronics shop in Anchorage had new stock of replacement batteries, so I may also get another set for this new-old-stock unit that I’ve had to use as stopgap. In either case, I need to remove the old unit due to oder & safety issues. The batteries we use are Valve Regulated Sealed Lead Acid (VRLA). They are similar to the batteries used in cars except the electrolytic fluid found inside is in small pads attached to the lead plates, and is not full of this fluid. These pads can dry out over time, especially with little use. Your battery most likely now has several “dead” cells from sitting for so long. The charging voltage most likely caused the remaining plates to overheat and boil the remaining fluid, resulting in venting. We recommend first removing the unit from an enclosed space. Once you are no longer in an enclosed space, you can remove the internal battery. There is a good change the UPS itself was not damaged, and could accept a replacement battery. For further assistance please contact our tech support team. They will be happy to walk you through the process and answer any remaining questions. I have seen strings of batteries where the mho’s are all over the place after a few years in service. I have been told by the battery OEM’s and dealers that to prevent this one should run the UPS on load for some time (5 – 10 minutes?) on a periodic basis. The thought I believe is that will keep one or more of the batteries from losing all there mhos and going bad. This procedure apparently normalizes the battery string. However my UPS mentor says this is false as these lead acid batteries do not have “memory” characteristics and that this load running will not help with string homogeinity, thoughts on this? Lead Acid batteries are very different than lithium-ion and NiCad batteries which do form a bit of “memory”. That being said, Lead Acid batteries will sometime develop sulfate on their lead plates. To counter this, it is recommended to discharge and recharge the battery on a regular basis. APC units are designed to perform a self-test every time it is turned on and then automatically every 14 days following. This function of the UPS should be adequate to minimize sulfation on the lead plates. Hi, Justin. Could you please take a few minutes to comment/answer my post in the thread above from 9/28/17? I apologize, we must have missed your comment. In general, UPSs should not pose a fire safety issue, however I understand your circumstances and wanting to be as careful as possible. As UPSs get older they may become more susceptible to electrical disturbances which can potentially weaken internal electrical components. In regard to replacement intervals, there is not an official policy, however VRLA batteries like the ones used inside your APC UPSs last 3-5 years under recommended conditions; and a good rule of thumb for an APC Back-UPS is roughly 5 years or when the unit requires a second battery replacement. A general rule to remember is that for every 8.3°C (15°F) above the ambient temperature of 25°C (77°F), the life of the battery will be reduced by 50 percent. Therefore, if you are operating the UPS at ~100°F you can expect the battery to last less than 50% of it’s normal life. I’ve just bought a new SMX750I, but the test sheet stuck to it says it was made in April 2016…. so I guess it was sitting in stock for quite a while. Is the battery likely to have suffered as a result? Is there anything I should do to condition it? You should not have to do anything to condition the battery. Our distribution centers and factories will periodically test and recharge batteries as needed, so your APC battery should not have suffered any performance degradation. I purchased a new APC Back-UPS 2200VA — Brazil Model BZ2200BI-BR last week. It has been plugged in and running for more than 50 hours, and its battery led, indicating the batteries are charging, has been continuously ON for twelve hours longer than the manual says it will take the battery to charge (12 hrs). It seems to be working OK, powering only a modem — plugged in about 2 hours after turning the UPS on — and occasionally a monitor and laptop for very short periods of time, but the battery light stays permanently ON (no beeping of flashing). My guess is the vendor shipped me a unit that has been in stock too long, and the 4 batteries are no good now, but I am not an expert. What do you think is wrong? If the battery led does not turn off by tomorrow, indicating the 4 batteries are fully charged after 36 hours, I intend to return the product for a refund. Would you agree this is what I should do?